Each week we feature an app that has caught the attention of the Crozdesk community. We look for exciting features that make our lives easier, apps that take a radical approach to existing problems or a service that has everyone talking about it. In other words, apps that we think you should know about. 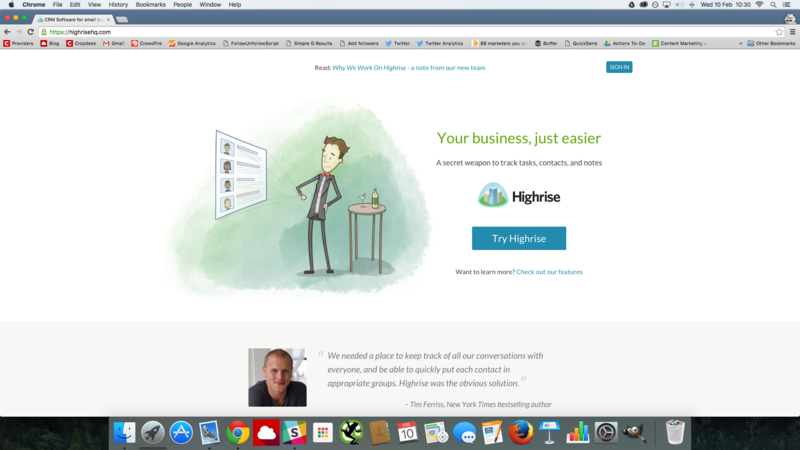 This week, we’ve reviewed Highrise – an easy-to-use CRM solution for small businesses. Any business serious about customer relationship management and sales will understand the importance of a fit-for-purpose and time-efficient CRM platform. Poorly designed CRM software can result in the loss of valuable sales opportunities and have a negative impact on a company’s profitability. 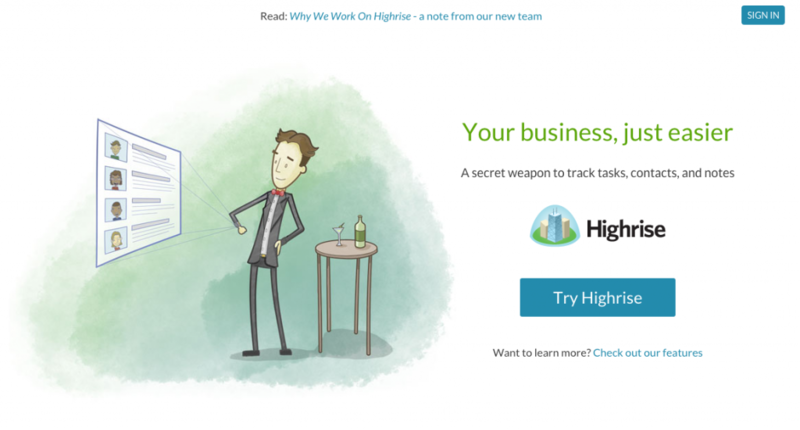 This is where Highrise comes in – a well-designed CRM solution, aimed at the small business market. 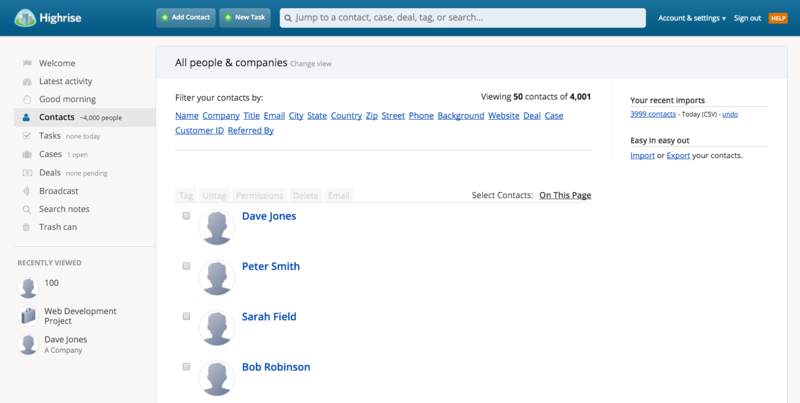 Contacts form the hub of any CRM tool. Having created or uploaded contacts to Highrise, users can update contact records with information such as title; company; phone number; email address and URL, as well as assign a photo to the contact. Custom fields can be set up and a referral source for that contact can be specified – useful for keeping track of which team member or source referred that contact. 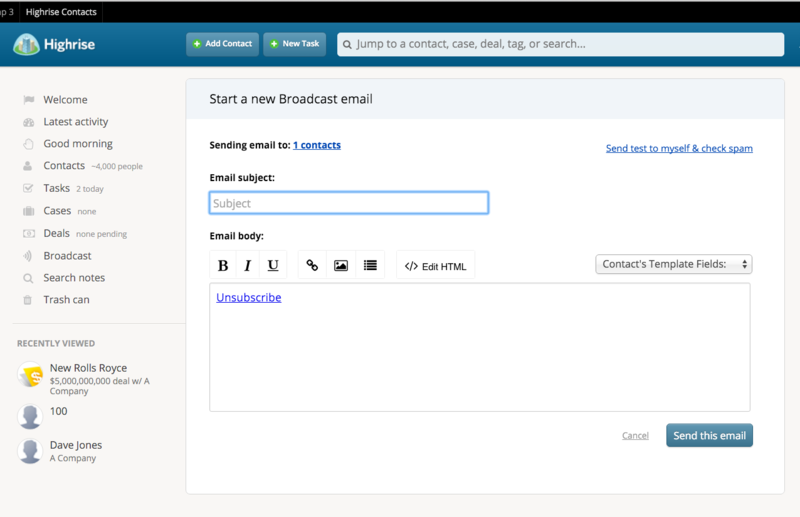 User preferences can also be set, enabling certain users to only view certain contacts. 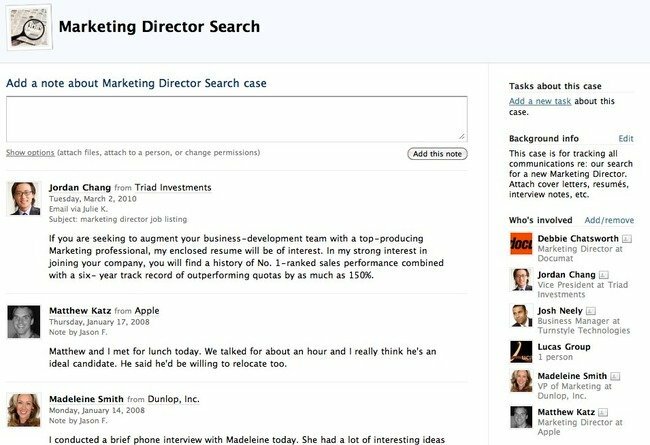 Users can manage contacts using filters, while tags can be assigned in order to enable sales teams to keep track of who they have and haven’t contacted. 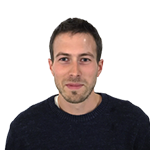 Usefully, vCards can be downloaded for each contact and a complete list of contacts can be exported as a CSV or Excel file, or as a Zip file containing all contact-specific notes and emails. 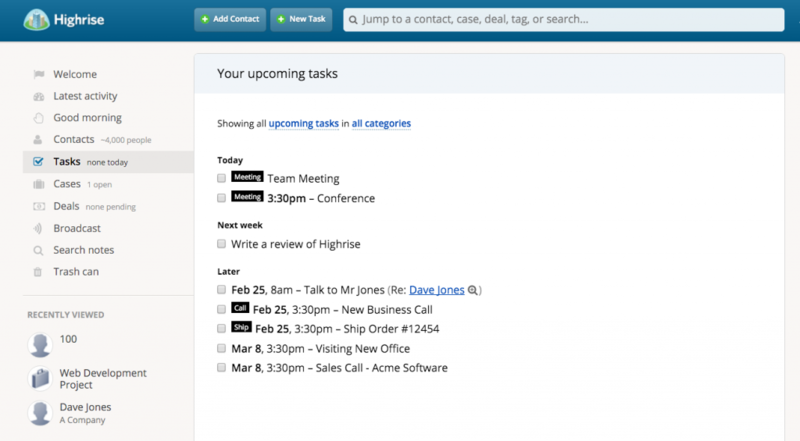 Simple, yet very useful, the tasks feature within Highrise is designed to ensure that teams keep track of important deadlines and appointments. 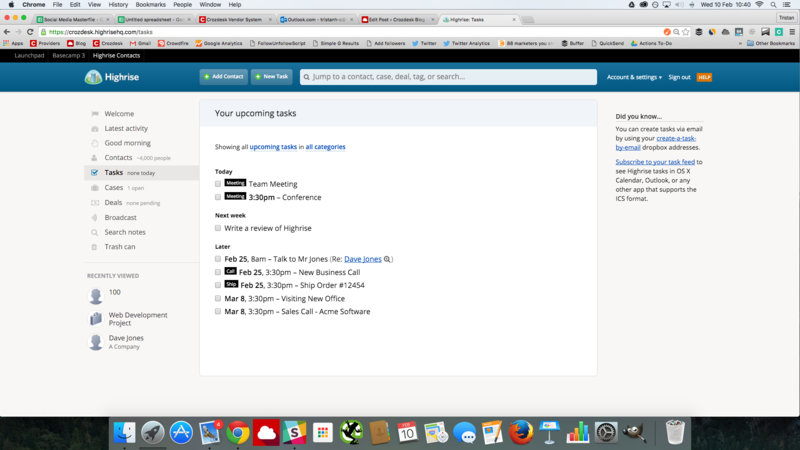 An innovative feature allows users to create new tasks by emailing Highrise with the name of the task in the subject line of the email. Tasks can also be assigned specific categories and associated with specific cases or deals. The cases function within Highrise is a virtual file folder, allowing users to keep related emails, notes, files, images and contacts together, ensuring that information is easily accessible to all users. 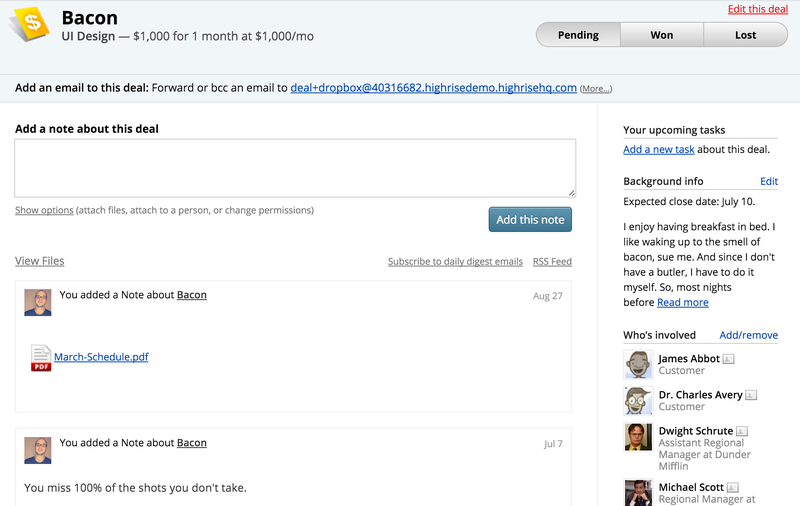 With deals, users can track bids and proposals, allowing sales teams to know where new business is coming from. Notes and change logs relating to specific contacts can be viewed, along with a clear record of which proposals are pending, won, or lost. 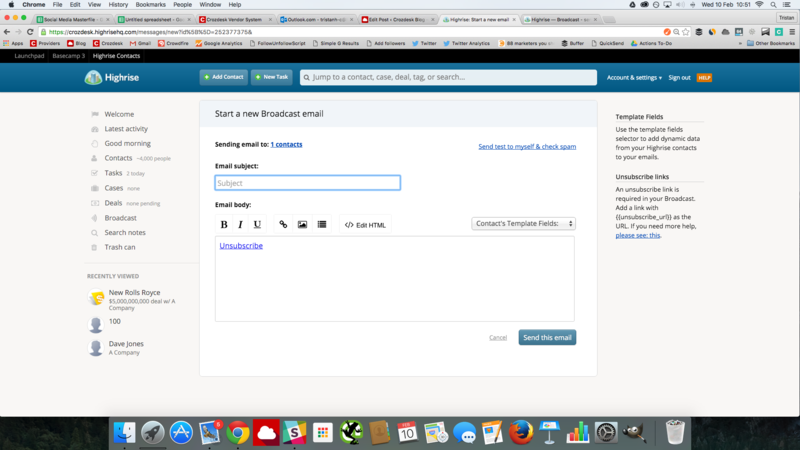 Highrise’s Broadcast feature enables users to send emails in bulk; the feature can be activated by selecting a group of contacts and using the email tab to start a new Broadcast. 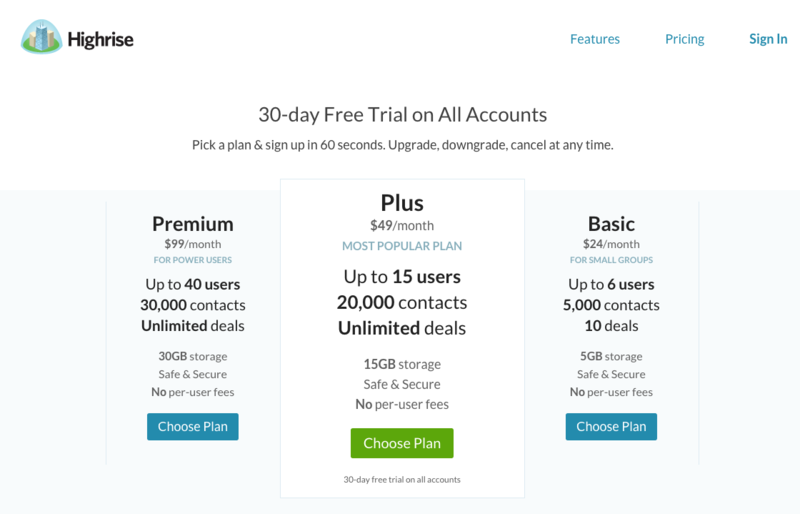 When it comes to pricing, Highrise is available for $24 per month with the basic package; this includes 5000 contacts for up to 6 users – more details can be found on the Highrise pricing page. 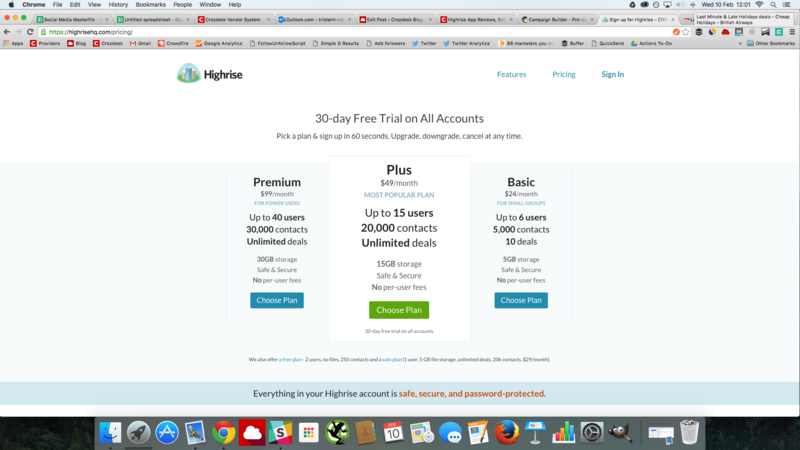 Highrise is a simple and capable app for anyone looking to efficiently manage customer and sales contacts. Enabling large volumes of contacts to be uploaded, tagged, filtered and tracked with ease – Highrise is a strong contender in the CRM software marketplace. Find out more about Highrise, visit the Crozdesk Highrise provider page.